Niaouli essential oil has been derived commercially from the tree of the same name now for well over 100 years, although it has taken many years to correctly identify and classify it botanically. This is because there are several plants with strikingly similar appearance that were originally mistaken for niaouli. Over the years a wide range of common names and synonyms were associated with all of these species which added to the confusion, taxonomically speaking. 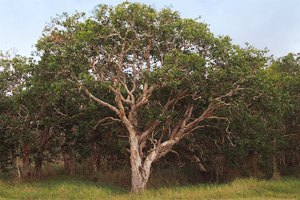 For example, over the past 100 years niaouli has at various times been identified as; Metrosideros quinquenervia, Melaleuca viridiflora, Melaleuca leucadendron var. viridiflora, Melaleuca smithii, Melaleuca maidenii,, with common names such as the Broad-leaved paperbark tree, White bottlebrush tree, Punk tree and the Five veined paperbark tree. Strewth! Thankfully, in 1993 taxonomists finally got their act together and agreed on its current botanical identity of (Melaleuca quinquenervia var. cineole) which includes its chemovar (chemotype variety), since there are at least three different types. In Australia the three primary chemovars are nerolidol, linalool and 1,8 cineole. 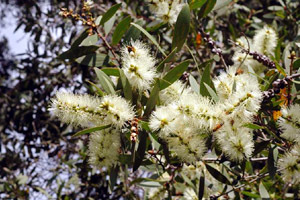 Closely related to tea tree, eucalyptus and cajuput, Melaleuca quinquenervia var. cineole is a medium sized evergreen tree that typically grows to a height of around 12 metres, although under some conditions it can achieve 25 metres. The trunk is covered in a thick, whitish-grey or pale brown papery bark that grows in untidy layers which split and peel, often appearing extremely rough in texture particularly on larger mature trees. The stiff, leathery, dull green leaves are lanceolate with 5 (sometimes 3 or 7) prominent parallel veins that run from base to tip and produce a powerful resinous-eucalyptus type odour when crushed. The leaves are the source material of niaouli essential oil. Branches on the tree bear small, dry, woody fruits about 5mm in diameter, and the fluffy spikes of flowers are broad and stalk-less (sessile) and usually white or pale cream in colour, occasionally with shades of red or green. It propagates by means of seeds stored in the fruits which are released in large numbers when disturbed, or injured by fire. The variety M. quinquenervia var. cineole is believed to have originated in New Caledonia, where it was first distilled in the province of Gomen, hence the old industry name for this product of ‘gomen oil’. Unfortunately, this is an aggressively invasive tree and in a single year it can produce a dense thicket of saplings nearly 180 metres (600 ft) in diameter. 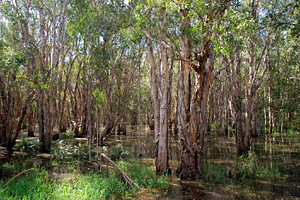 It also occurs naturally throughout Queensland, New South Wales and southern New Guinea, and has been widely distributed and naturalised throughout the tropical regions, especially dry tropical lowlands such as India, Madagascar, the Philippines and the West Indies. 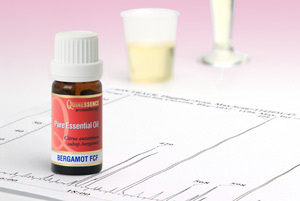 Essential oil production from this specific cultivar mainly occurs in New Caledonia and Madagascar. During Captain Cook’s first voyage to Australia in 1770, specimens of M. quinquenervia were collected by the naturalists Joseph Banks and Daniel Carl Solander, after observing the Aborigines using decoctions of the leaves. 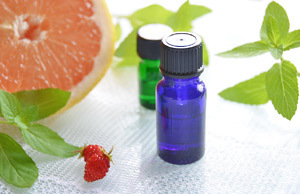 They used it to treat aches and pains, cuts, skin conditions, infections, insect bites, respiratory conditions and just about everything we use the essential oil for in aromatherapy today! These, and other samples of Melaleuca were brought back to England on-board HMS Endeavour for further study. 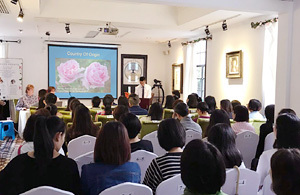 Niaouli essential oil obtained by steam distillation of the leaves and terminal stems, and yields a pale yellow essential oil with a fresh, sweet camphoraceous, slightly herbal fragrance. To the untrained nose, niaouli oil smells very similar to eucalyptus due to the high content of 1,8 cineole which is its principal constituent. However, closer examination reveals a softer, more rounded herbaceous aroma than eucalyptus, and of course it has therapeutic characteristics that are similar, but different to those of eucalyptus. In a French study (Chir Dent Fr, Sept 9 1976; 46:  53), niaouli essential oil was investigated in the form of a vapour to test its efficacy against bacteria such as staphylococcus, streptococcus and proteus. 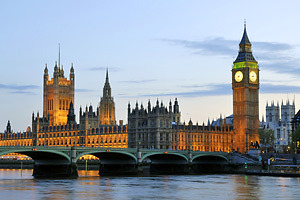 The results showed that within three hours almost 85 per cent of the microbes were killed. Niaouli essential oil has also been shown to be very effective against candida albicans, herpes simplex, viral hepatitis, influenza and in fact most types of infectious respiratory ailments. Niaouli is an effective immunostimulant essential oil that increases the antibody and white blood cell count making it ideal for boosting the immune system and as a recuperative oil. When used as an inhalation, niaouli essential oil can be used to treat respiratory infection of many types, and can be gargled at the onset of a cold or sore throat. If you have sensitive skin, niaouli is an ideal alternative to tea tree oil since it is very gentle (even undiluted) yet it’s still a highly effective antibacterial agent. Also, its aroma doesn’t dominate in blends like tea tree sometimes does. As a comparison; tea tree is probably the best all round antiseptic, whereas niaouli essential oil is more preferable when fighting bacterial and viral infections. In some hospitals niaouli has been used to reduce the severity of burns during the treatment of cancer, when using cobalt radiation therapy. Because it is well tolerated by the skin, a thin layer of undiluted oil can be applied to the skin before each treatment to reduce the severity of the burns whilst helping and accelerating the healing process. Niaouli essential oil is considered a top note in aromatherapy and adds a freshness to blends with basil, coriander, cypress, fennel, geranium, juniper berry, lavender, patchouli, pine, peppermint, spearmint, tea tree and all citrus oils. Much of the disorder with the taxonomy of this species occurred because there are several chemovars which, because of their geographical location, produce leaf oils of widely varying composition. This makes accurate identification extremely problematic since it can be difficult for botanists to determine whether they are examining a species with a natural variation, or an entirely different species. The principal chemovar found in New Caledonia is a 1,8 cineole variety which is used to produce their popular and highly effective niaouli oil. In South Florida where it was introduced in 1906, the invasion of M. quinquenervia has resulted in a 60% to 80% loss in biodiversity of the surrounding freshwater herbaceous marsh-plants, and millions of dollars are spent every year in an attempt to control its spread.